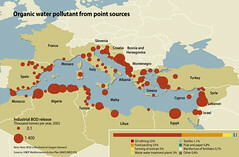 Organic-matter pollution in industrial wastewater was documented by MED POL through an inventory of industrial point sources of pollution in 2003. The areas with the highest Biochemical Oxygen Demand (BOD) are the southern shore of the Western Basin, the eastern coast of the Adriatic, the Aegean and the northeastern sector of the Levantine Basin. 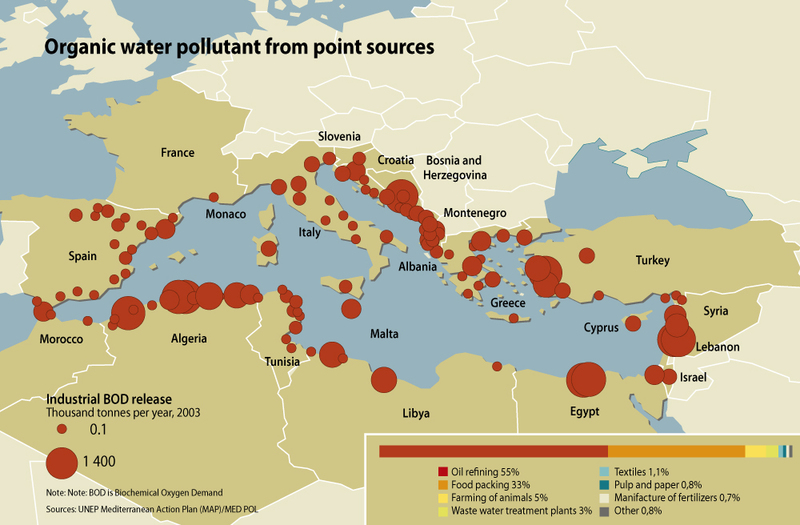 These regions, in general, also have insufficient sewage wastewater treatment facilities. This indicates that there is likely a cumulative effect of elevated organic matter in coastal waters from a combination of domestic and industrial sources (UNEP/MAP 2012). In the northern Mediterranean BOD is mainly released by wastewater treatment plants and the food industry, while in south and eastern Mediterranean other sectors like oil refining, farming of animals, textiles, paper or fertilisers are important emitters (UNEP/MAP/MED POL 2012).